We’ve recently wrote some details about the UK mobile betting market. Let’s now get into the details of the applications that bookies offer in this space starting from what probably is the most interesting as the fastest growing one at the moment – Ladbrokes Mobile. First of all we need to admit it does look smart and professional on the very first view. The user experience should be a very easy as all main features are available from the very first screen. On top of the app you have your login and menu section which allows you to quickly navigate between sports and features as well as quickly login or create a new account. Then we have all the promo information in a nice rolling menu. Really smart part as it gives a lot of information about both new and existing customers offers without taking the focus from the betting part of the app. Following this the app is fully betting focused with 3 main section including Highlights, Next Races and In-Play. It’s easy to navigate and allows you a quick move to where you want to be. In-Play betting section looks really well with current score and available odds clearly visible on the app. 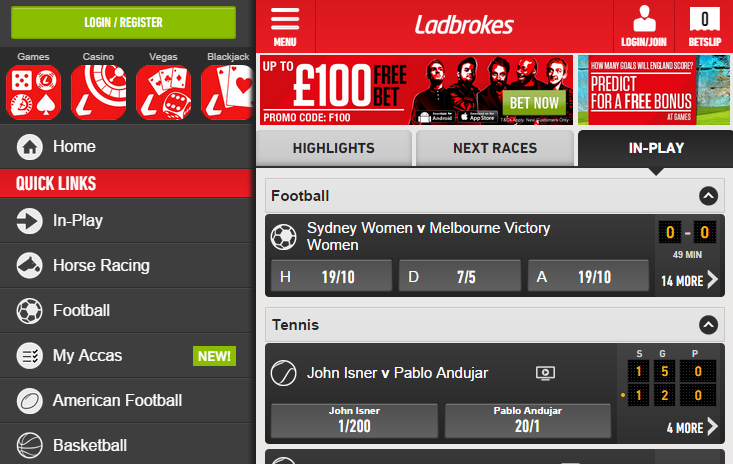 Ladbrokes mobile menu is probably the strongest point of their app – that’s at least according to experts that see it as a real market leader. We tend to agree with this opinion as it is really clear and easy to navigate. It gives a good idea how the whole app works. When it comes to bet placement it’s also quite a simple and easy process. It’s just enough to click on the selected odds and pop-up bet slip will appear. 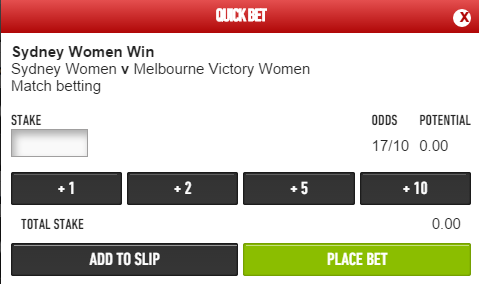 Easy to select stake, check the potential win and confirm the bet.